1 "C'mon, Mom! The Frugal Garment closes in 3 hours!" Mrs. Rettis sighed. 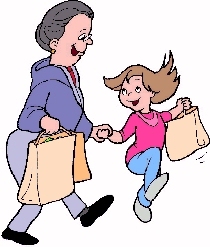 It was an annual chore to shop with Melody for school clothes - usually she had to drag her along, but this year she voluntarily gave up babysitting to shop with her mother. Mrs. Rettis was impressed, until Melody said, "As long as we go to the Frugal Garment." 2 The Frugal Garment was a second-hand store specializing in bizarre attire. It was usually crowded with overstuffed racks and other debris. Mrs. Rettis preferred that they go to a prominent department store, but had agreed to start at the Frugal Garment (to get it over with!) When they got there, Melody zoomed through the store as if she were driving an imaginary sports car. Thankfully, she quickly passed the saucy clothing and headed for racks with clothes more discreet.